The Days Inn Vancouver front desk staff is always available to answer any questions you may have about our hotel, including what we offer our guests in terms of accommodations and amenities, current rates and specials, packages, directions and what to do in the area. Contact us any time as we love hearing from our soon-to-be, current and repeat guests! You can also book your accommodations online using our quick, easy and secure reservation system. We look forward to hearing from you soon. For easy directions to our hotel, please use the map below. A taxi will cost you $30 – $35 from YVR Vancouver International Airport to downtown Vancouver. Estimated drive time: 35 minutes. Take the Canada Line Skytrain from the Vancouver International Airport and get off at Granville Station. 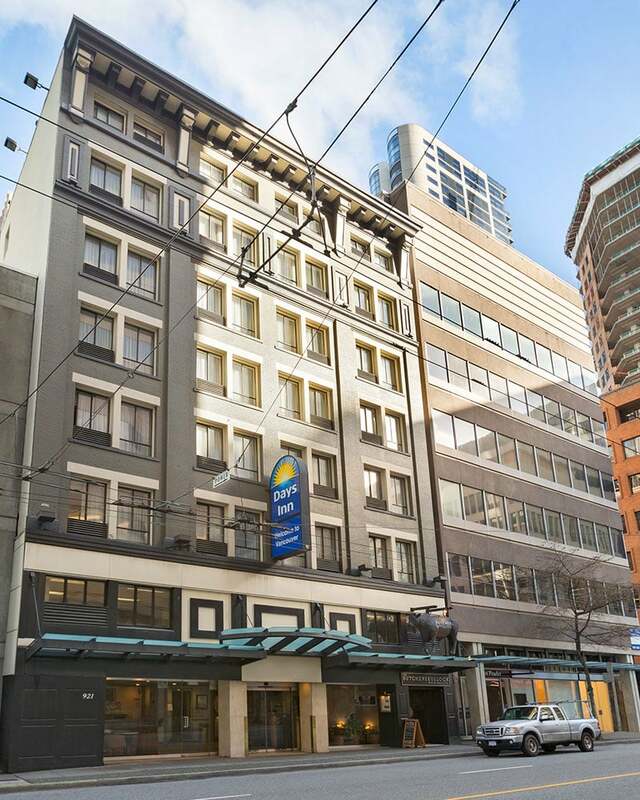 Our hotel is two blocks from Granville Station on West Pender Street. Estimated drive time: 25 minutes. Follow the signs to Downtown Vancouver. You will travel over the Arthur Laing Bridge. The bridge will take you down Granville Street. Take the Seymour Street Exit, off the Granville Street Bridge. Follow Seymour Street until West Pender Street. Turn left onto West Pender Street. Our hotel is three blocks ahead on the right. After the border, the I-5 becomes Hwy 99. Drive on Hwy 99, following the signs towards Vancouver City Centre. Continue through the tunnel and over the Oak Street Bridge. Turn left at Oak Street and 41st (or anywhere else before 10th). Turn right onto Granville Street. Go over the Granville Street Bridge, take the Seymour Street Exit. Follow Seymour Street to West Pender Street, where you will turn left. The Days Inn Vancouver is four blocks ahead on the right. 99 South across Lions Gate Bridge and through Stanley Park. Stanley Park will bring you onto Georgia Street. Georgia Street is three blocks to West Pender Street. Left on West Pender Street. Six blocks to Burrard Street. Two blocks to Howe Street. One block to West Pender Street. Right at West Pender Street. One and a half blocks to our hotel. We are on your right and you can park in front. Hwy 1 (Trans Canada) exit Hasting Street. Left at Hasting Street. Continue 15-20 minutes into downtown Vancouver to Howe Street. From our hotel, go west on Pender Street. West Pender Street runs into West Georgia Street. Stay in curb lane and follow signs to Stanley Park. Estimated drive time is five minutes. Turn right on West Georgia Street. Georgia Street turns into the Lions Gate Bridge. On the bridge, follow the signs to Hwy 1 West. Follow Hwy 1 to the Horseshoe Bay Terminal (watch for signs).